Wonderful! I’ve downloaded it and it looks great. What I don’t see immediately is the ability to import one’s own data set and make a motion chart from that. Perhaps I’m overlooking something? Thank you very much for your great service. Your programs are extraordinarily useful in presenting historical trends of major developmental issues. I have used your “moving tables” and videos a couple of times in my class on “Economic Development”, and now you provide this additional option, which is quite convenient to use and versatile in its applications. That is great. 5/3/[email protected]:27 unable to download GapMinder; clicking the button causes the new screen to appear, however the new screen does not allow the download to occur. Clicking try again does nothing. 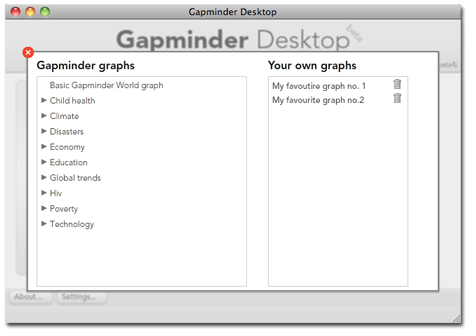 Thank you very much for making Gapminder Desktop available. I work for a hospital and would like to create my own graphs. I see how to create my own google gadget with my own data. 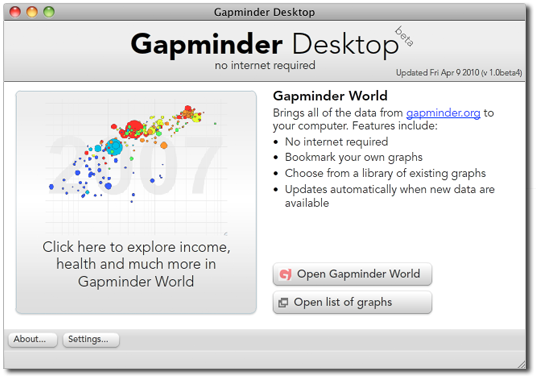 But the google gadget isn’t the same as the Gapminder Desktop. any answers to your request. if you know how to do it your help will be appreciated. Gapminder is telling us that we must DOWNLOAD Adobe AIR Technology or give our data to Google Docs in order to use their innovative data visualization strategy? Do we really want to agree to the coercive and restrictive terms of agreement just to visualize data with this tool? AIR and FLASH are proprietary! Using such tools, including uploading data to Google Docs, takes away end user freedoms and privacy! Why doesn’t Gapminder release their software under the GNU Public License? It is truly unfortunate that Gapminder.org forces individuals such as myself to search out other innovators who care MORE about end user freedom than Gapminder.org, Google.com, and Adobe apparently do. Certainly there are other people who either have successfully created similar visualization functionalities as those seen in Gapminder or who are working on such projects. One can hope that such innovators have decided start and end their endeavors with a mission statement congruent with ethical and philosophical principles promoting end user freedom and data privacy. I gladly contribute my money to such projects. I will ONLY use GNU Public Licensed software such as the R Statistical Program and 100% Free/Libre GNU Public Licensed operating systems (e.g., gNewSense). Let me know when Gapminder.org changes it’s philosophy to one more congruent with promoting individual liberty and privacy and I’ll strongly support Gapminder.org’s work by using your Free/Libre tools and contributing financially to the project’s further development. When I tried to download it, it says the AIR file is damaged. May I ask for a new AIR file? P.s. Thanks for an excellent speech today at IFLA. It is the best speech I have ever heard. It is very inspiring. I have had my students view your amazing presentations for over two years, but hearing your speech here was an unforgettable experience.